Oscar Domínguez fell under the influence of Surrealism after meeting Pablo Picasso and Yves Tanguy in 1929, eventually becoming an active member of the Surrealists in the circle of the poets André Breton and Paul Éluard. 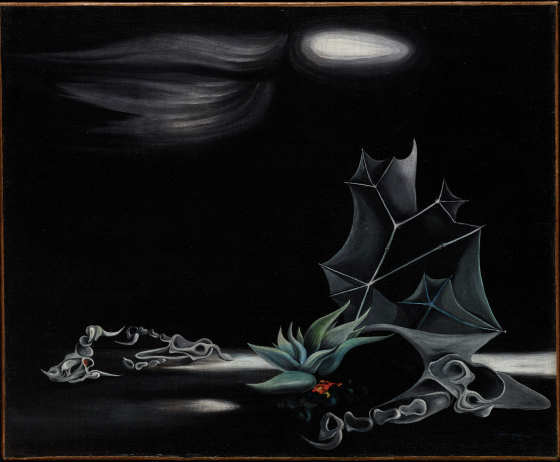 Cosmic Composition belongs to a series of paisajes cósmicos (cosmic landscapes) produced in the late 1930s that are characterized by strange, otherworldly forms and colors. Here Domínguez conjures the familiar shapes of wispy clouds, celestial bodies, leafy vegetation, and skeletal forms. In spite of these recognizable references, this cosmic world exists outside of the realm of objective, lived experience. It is an imaginary dreamscape—a recurring theme within Surrealism—that evokes the far reaches of the subconscious as well as greater cosmic mysteries.